It just got unreal! Unreal Engine 3 can export to Flash 11 with Stage3D as an export platform. This is amazing news for game development and provides a strong competitor to Unity for high end gaming experiences that run in Flash. On Tuesday during the Adobe Max conference in L.A., Epic CEO, founder and technical director Tim Sweeney announced UE3 support for Adobe’s Flash player. 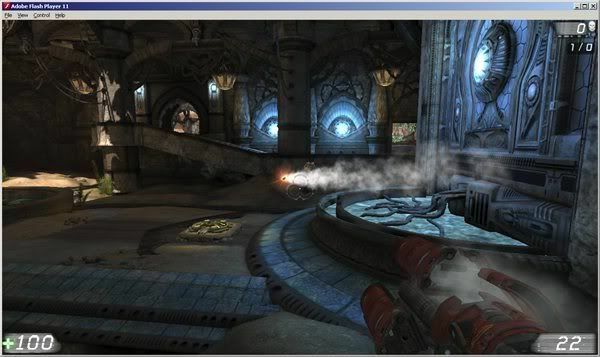 Industry veteran Sweeney showed a live demonstration of UE3 running inside the recently-released Adobe Flash 11 during his keynote at the conference, using the PC, Xbox 360 and PlayStation 3 game Unreal Tournament 3 as an example. UE3 works well thanks to Flash 11′s hardware accelerated, programmable graphics pipeline, Adobe said. Flash is now “capable of running triple-A gaming content authored for high-end platforms using the industry’s latest tools and technologies,” the company said in a statement. UE3 licensees will be able to access new Flash features, and more information is available at the engine’s official website. Hopefully this will be included in the UDK soon if not in next months release. But to calm the hype a bit, the reality is, it costs much more to develop a high end game in Unreal 3 compared to current web games but this will open up a whole new high end market and allow game developers to add another platform to export to. Game sites will become full on consoles. Next-gen consoles for XBOX and Playstation aren’t being updated until 2013-14, that seems a long way away and they just might not exist as we know them when that time comes. The next console just might be the web on any device, TV, pad, hardware consoles… Unreal and Epic are preparing for this multi-platform game development world along with Unity, Flash and others.